TORONTO, 2015-7-6 — /Travel PR News/ — Bombardier Commercial Aircraft today welcomed Qazaq Air to the family of Q400 aircraft operators and joined the airline in introducing the technologically advanced turboprop to local government and aviation industry representatives, regulators, other invited guests and media during a press conference in Astana, Kazakhstan. Qazaq Air, a subsidiary of Samruk Kazyna, Kazakhstan’s Sovereign Wealth Fund, has announced that it will launch domestic service in Kazakhstan with three Q400 aircraft leased from Falcon Aviation Services LLC of Abu Dhabi. “We thank Falcon Aviation for providing us with their aircraft and for all their support in the months running up to this launch. We look forward to improving the air transport offering to the Kazakh people. Many of the 12 routes on which the Q400aircraft will operate are not currently served by any other carrier. Qazaq Air — using the Q400 aircraft — will be connecting people and helping them benefit from the growth of the Kazakh economy,” added Mr. Pollock. Thanks to its combination of turboprop attributes, jet-like features, industry-leading passenger experience and environmental footprint, the Q400 aircraft is exceptionally versatile and can be adapted to a variety of business models. By offering a 30% reduction in fuel burn over the jets it often replaces, the Q400 aircraft radically reduces carbon emissions and increases cost efficiency. Its high-speed cruise — 160 km/h faster than conventional turboprops — places the aircraft’s flight time within minutes of jet schedules, at the same seat cost as larger single-aisle jets. Its large propellers operate at a lower RPM, generating more power with less noise and making it a friendly option for city centres. The Q400 aircraft family includes over 60 owners and operators in almost 40 countries worldwide and the worldwide fleet has logged more than 6 million flight hours. The aircraft has transported more than 370 million passengers worldwide. Bombardier has recorded firm orders for a total of 546 Q400 aircraft. Images of Qazaq Air’s Q400 aircraft are posted with this press release at www.bombardier.com. 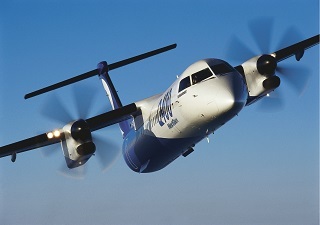 Additional information on the Q400 aircraft is available at http://news.commercialaircraft.bombardier.com. This entry was posted in Airlines, Airports, Business, Transportation, Travel, Travel Management, Travel Services, Travel Tech and tagged Blair Pollock, Bombardier Commercial Aircraft, Colin Bole, Q400 aircraft operators in Kazakhstan, Qazaq Air, Samruk Kazyna. Bookmark the permalink.